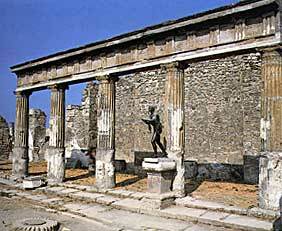 The Temple of Apollo was built in the third centruy B.C. Originally it was formed of 48 Ionic columns, but in Nero's age they were changed into Corinthian columns. There were several different deities in the temple: Apollo, Diana the Huntress, and possibly Mercury. The cella is on a high platform and is the most sacred part of the temple. 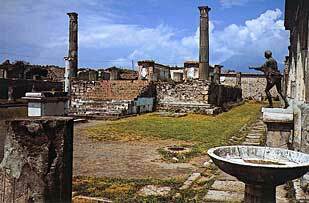 The Temple of Isis is the best preserved temple of Pompeii. It dates from the pre-Roman age and was almost entirely rebuilt after the earthquake of 62 A.D. at the expense of Popidius Celsinus. An inscription above the door mentions that Popidius Celsinus was only six years old when he was elected decurion. The sacred water of the Nile was kept in an underground passage. 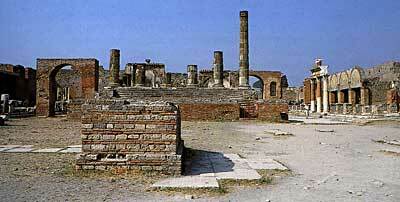 A large room that was used as a meeting room for the initiates of Isis is behind the temple. The Temple of Jupiter was built in the second century B.C. 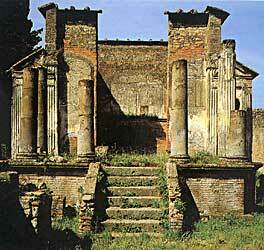 during the Samnite age, and closes the forum square on the north. Dedicated to Juno, Minerva, and Jupiter, it had a vestible or pronaos of twelve Corinthian columns, three on each side and six at the front. Inside, the cella had mosaic marble floors. A covered market, The Macellum, was built during the Imperial age. Small shops, or tabernae, were situated outside the covered square. A water basin, or tholos, is in the center of the uncovered area, and toward the right of the Marcellum there is an area with a gutter for water for the fish market. Center: Temple of Jupiter. Far Right: Macellum Buildings. 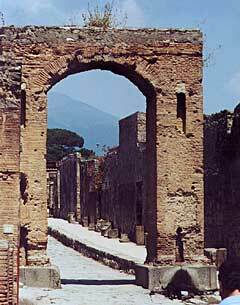 The road leading from the forum to the northern walls of the city has two arches. 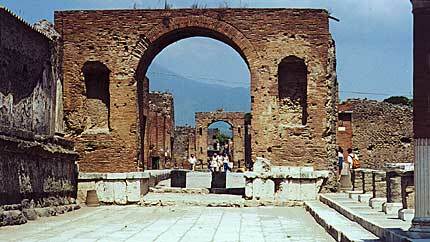 The arch that face the main road of the city, called Road of Fortuna, is decicated to Caligola, and the arch to the right of the Temple of Jupiter is in honor of Nero Caesar. Arch in Honor of Nero Caesar; Arch of Caligola is in the Background.